Went to bed with a very sore hip (very painful for walking and standing, but doesn't hurt at all on the bike for some reason), but woke up feeling fine. 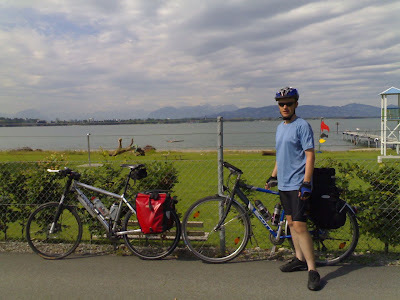 We found the lakeside cycle path and continued alongside the lake and over the 'old' and 'new' Rhine. Only in Austria for an hour before we crossed into Switzerland, and we travelled through Rorschach and Arbon before heading inland into the countryside. Turned grey, but didn't rain until 1pm, when we arrived for lunch at the Schloss in Hagenswill, the village where James's other half Erika went to school. The castle has a moat with huge carp in it and we had fantastic sausage and chips with gravy for lunch. 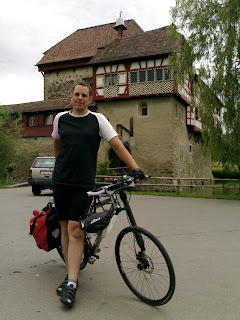 We continued on to the hamlet where Erika grew up on her father's cheese factory and through Bishofszell where we picked up the cycle route towards James's village of Grafstal.